Our comprehensive guide on how to shoot a pistol is intended to bring new shooters up to speed, and give those looking to review the basics a concise resource. 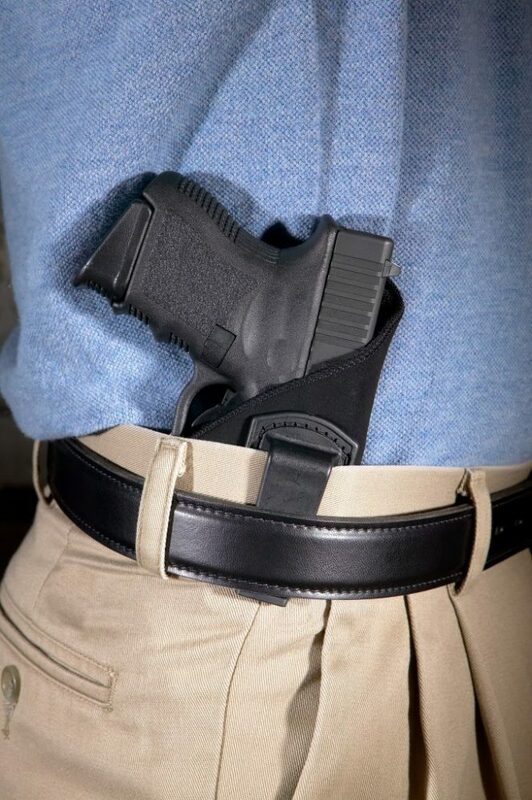 We want to emphasize right off the bat that this subject fills volumes, so use this as a resource to guide your practice in the fundamentals while wearing your new IWB holster. With that out of the way, let's talk about how to shoot a pistol. Before shooting a pistol, you need to know how they work. If you're new to firearms, a good place to start learning how they work is with this detailed infographic that the NRA and OutdoorHub created. Based on the information above you can tell that your experience shooting a pistol will vary based on things like the size of the firearm, and the amount of gunpowder in the cartridge. The pressure unleashed by the exploding gunpowder is also transferred into the pistol and causes recoil. Larger, heavier pistols absorb more recoil, and a smaller, shorter cartridge generates less pressure. This means if you shot a larger caliber bullet in a smaller firearm the recoil will be more significant. Keep in mind that as a pistol heats up from being fired multiple times in a relatively small time frame, its accuracy will decrease. This is why some firearms have what's called a "bull barrel" or thicker barrel to withstand more heat to maintain better accuracy. We recommend you find a range that rents firearms and try out some of the different pistol models. This will allow you to feel the differences for yourself. 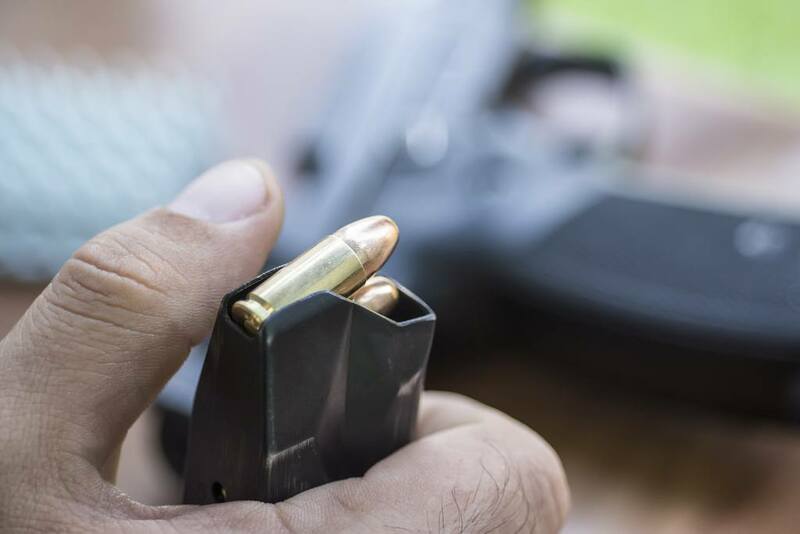 While doing this remember that according to some fairly extensive studies, common self-defense pistol calibers are roughly equivalent in terms of overall effectiveness. In other words, you feel more comfortable with smaller caliber such as .380 ACP, than use it over a more powerful cartridge gun. All eyeballs are not created equal. For most people, one of them provides a little more sensory input to the brain than the other one does, and serves as your default frame of reference for where things are. That's your dominant eye, and if it's on the same side as your shooting hand, you're all right. Here's a handy test to see which is dominant. Put your hands out in front of you and make a diamond shape with your hands, and focus on an object in the distance. Then close one eye at a time. One eye will make the object jump to the side, and the other will keep it still. The eye that's open when the object doesn't move is your dominant eye. You now know which eye is dominant....Great! For all you "lucky" dominant right hand/eye or dominant left hand/eye people you will aim using your dominant hand and aim with your dominant eye when shooting. Easy enough. If you are shooting with both eyes open (better for tactical situations) watch the following video. Just remember what works for one person may not for the next. Continue to try different ways for cross-dominant shooting, and go with the one that you feel the most comfortable with. ​Shooting is a whole-body activity. As much as possible, you want to use your whole body to absorb the recoil and keep you as stable as possible. Your physical stability will be a critical factor in whether or not follow-up shots land, so it matters quite a bit to your preparation. You also want to make sure you have a comfortable pair of tactical pants to wear while shooting. In general, you want to stand in the way that feels natural, but always remember that it's vitally important to lean forward. No matter how much of a tough guy or woman you are, your natural reaction to loud noises and fiery explosions going off near your face is to back away. Your body interprets this as instructions to lean back like you're cruising the Bahamas, not slinging lead on the range. 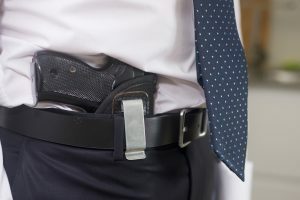 You have to fight off this urge and keep your body from bending away from the firearm you're holding. Lean into it and let your body weight take on some of the recoil. Now, let's review four basic stances. In the Weaver stance, the shooter's non-firing side should be slightly advanced towards the target with the firing side behind. The firing arm should be slightly bent, and the non-firing arm should be bent to support and help grip the pistol. If you're in this stance, your body should be turned slightly edgewise to the target rather than facing it squarely. Remember: you've got to lean forward into the position, helping your body absorb recoil that your wrists would otherwise have to take. The Chapman stance is quite similar to the Weaver stance, with the vital difference being the full extension of the shooting arm. Lockout your shooting elbow and build a bridge of bone from your shoulder through your forearm to your hand where the pistol is. Many Chapman shooters lean their head to the side to the point where it rests on their shooting arm. Some cross-dominant people find this stance especially helpful, as acquiring the sights in those cases requires a significant head-tilt to accomplish. The Isosceles stance resembles its cousin concerning foot placement and body position, squared off to the target with a forward lean. In the Power variant, the shooter extends his arms fully and locks out his elbows. Like the Chapman stance, the Power Isosceles relies on the stabilizing power of the skeleton to absorb recoil, minimizing the role your arm muscles play. This makes it ideal for shooters on the smaller side or those not confident in their arm strength. 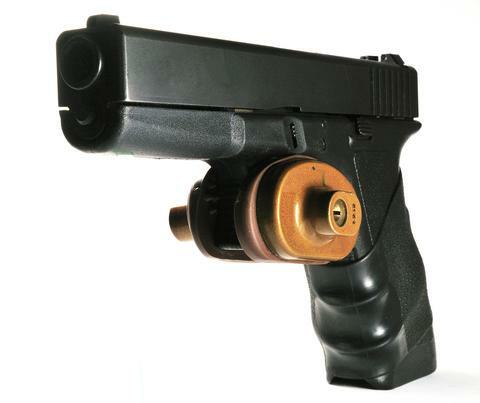 The unique Retention stance does not bring the pistol's sights in line with the shooter's eye. Instead, the shooter holds the pistol at waist-level on his firing side with his arm slightly bent. Naturally, the effectiveness of your fire from this position will diminish rapidly with range, but in return, this stance makes it much more difficult for an assailant to take away your weapon. To enter the Retention stance, stabilize your firing hand against your hip and level the barrel at the target. Be sure to keep your non-firing hand out of the way. Most experts suggest balling it up and holding your arm across your chest, ready to defend your face or strike an adversary should it become necessary. The Point stance allows for one-handed fire. Like the Retention stance, the non-firing hand is balled up and held across the shooter's chest. For the Point stance, the shooter takes a step forward with the foot on his firing side and extends his firing shoulder, arm, and hand toward the target. In principle, a two-handed stance is always superior. In the context of self-defense, that may not be a practical reality. The one-handed stances aren't going to take up the majority of your range time, but they're worth learning for sheer utility value. Your grip determines an enormous amount about the likelihood of your being able to hit the target, control the pistol, and make follow-up shots. Grip hard, but if you're crushing the grip as hard as you possibly can, back off a bit. Your firing hand should grip the pistol naturally with your thumb down and out of the way, and your non-firing hand should wrap around your firing hand from the front. Tilt your supporting hand forward and place the heel of your palm in any open space on the grip. That last point bears repeating: frequently, new shooters will cup the pistol from the bottom with their non-firing hand. 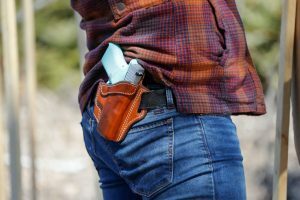 Not only can your offhand not absorb much of any recoil from the bottom of the gun, the tension it puts on your firing hand will make it harder to keep the pistol's vertical position steady. Support the pistol by wrapping your offhand around the grip, and make sure to keep your thumb out of the way of the slide. Check out the following video for one of the best instructional videos out there for gripping a pistol. Pistol sights typically consist of three dots in a line, with the outside two on the rear sight and the middle one in front. The shooter's goal is to bring them into line in front of his dominant eye, or with one open eye with the target centered under the front sight. Perhaps the single most crucial piece of advice when sighting is to focus on the front sight. It should be clear and sharply defined with the target blurry behind it. Once the pistol is on target, you can prepare to fire. Check out this handy infographic for more information on sighting in on your target. We recommend practicing both aimed firing using the sights and later, when you're confident, point firing from stances such as the retention stance. Shooting is very much a mental activity and requires focus: on your body, on the gun, on the target, and on your surroundings. It's hard to focus on multiple things at once, though, so we recommend practicing to make the physical parts easier. Your body is full of systems that can throw off your shot placement. Inhaling and exhaling change the shape of your chest and the angle of your arms. Even your heartbeat sends small tremors through your arms and hands. To minimize these effects, shooters learn the rhythm of their bodies and how to place their shots at the proper moment. There are two components to body control: breath and heartbeat. Consciously relax yourself. Slow your breathing, but don't hold it. After a few breaths, you should get used to feeling a brief pause between the end of your exhalation and the beginning of your inhalation. That pause is the key, the point at which your body interferes least with your accuracy. The opposite pause, between the end of your inhalation and the end of your exhalation, does not work as well. Your full lungs cause your sights to rise off target, and the tension in your rib cage can make your arms shake. The brief period of "emptiness" after you finish exhaling is the perfect time for the shot. With practice you can learn to time the trigger break between heartbeats during this pause, leaving you with the most stable platform possible from which to shoot. In the beginning, though, just concentrate on your breathing. Take it slow and easy; the more you relax, the better you'll do at the range. Where you position your finger on the trigger determines a lot about where your shots are going to land. For best results, rest the pad of your index finger squarely on the trigger. Pulling the trigger with only the tip of your finger can cause your shots to fly to the side, as can pulling the trigger with the joint of your first knuckle. While working on your trigger pull, we've found that it helps to keep in mind the fact that you're only moving your trigger finger. Keep the rest of your hand still and move that finger as smoothly as you can in one steady motion. The "break" of the trigger, the point that trips the firing mechanism and causes the gun to fire, should come as a surprise to you. The reason shooting a pistol is trickier than shooting a rifle or shotgun is that it only takes a small amount of movement to pull the barrel off target. This is true right up throughout your trigger pull, so work on keeping your trigger finger under control. Set the pad of your index finger on the trigger, then slowly squeeze it back to fire. If you start with your finger hovering over the trigger and pull from there, you'll slap the trigger, and the shot will fly off course. The same thing will happen if your pull is too jerky. Press firmly in a smooth motion while keeping the rest of your hand as still as possible. Don't worry if this isn't natural at first: It takes practice to build the discipline to hold your hands and fingers still while you smoothly squeeze the trigger. Keep your focus on that front sight while you wait to exhale, feel the pause, and pull gently with your trigger finger alone. Dry firing is the act of pulling the trigger on an empty chamber, causing the firearm's mechanism to set the firing pin in motion as if a round were present to be fired. 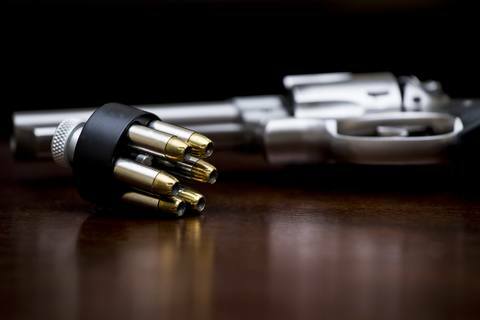 Conventional wisdom holds that dry firing is bad for the internal components of your firearm, particularly the firing pin, but in practice, most modern centerfire firearms are more than capable of withstanding an enormous amount of dry firing without suffering any significant wear and tear. If you're looking to practice your trigger pull without paying for ammo and range time, dry fire drills are okay starting point. However, we recommend everybody use snap caps instead. Check out the A-zoom section on Amazon for snap caps that fit your pistol. Just remember older, and rimfire pistols should not be dry fired. For older pistols, firing pins are more weak and brittle. When the firing pin hits the gun itself and not a primer of a bullet, damage to the firearm may occur. Morden centerfire pistols' firing pins are stronger and can withstand the stress of hitting against the pistol. For rimfire pistols, dry firing causes the firing pin to hit the entrance to the chamber. Not only can the firing pin get damaged over time due to dry firing, but the chamber itself can become so damaged that ammo will no longer feed. Practice your trigger squeeze with a dime drill. 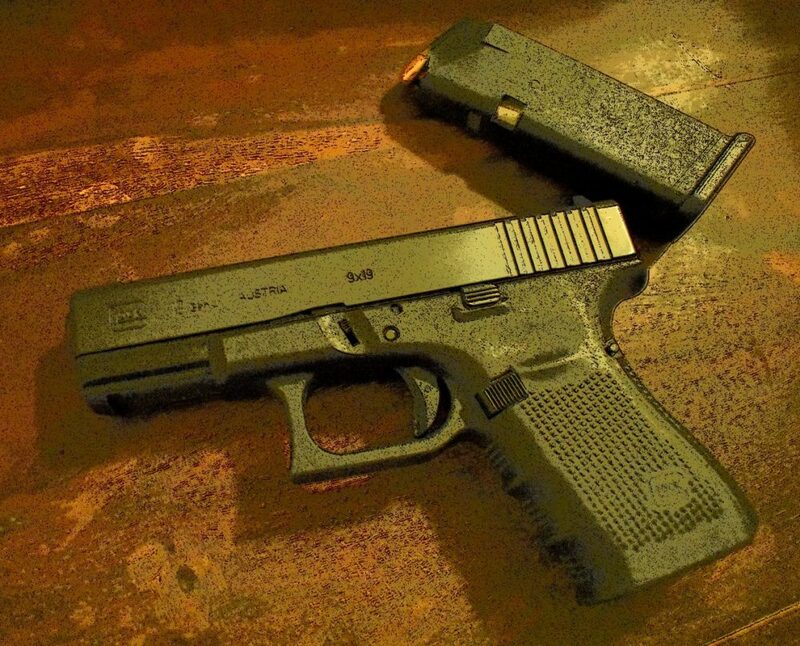 Take a dime and balance it on the front sight of your pistol, then get a good grip and pull the trigger. (For a revolver with a blade sight, balance the coin on the barrel instead.) If you trigger, pull causes the dime to fall off, put it back on and try again. Remember if you're causing the muzzle to move enough to unseat that dime, you're going to see your shots fly off target on the range. Practice that squeeze until you can apply full pressure without moving the dime, and you'll be well on your way to the level of accuracy you're trying to achieve. After you've gained some confidence with your handgun, you may find yourself wishing you could adjust the sights a bit. Like all other mechanical devices, no two guns are exactly the same. Some carry a bit high or low or to one side, even when sighted in properly with proper shooting technique. To overcome this, it can become necessary to adjust or also replace the sights on your pistol physically. That's a whole separate conversation, so if you're interested, check out our guide on the subject to learn more about advanced sighting. 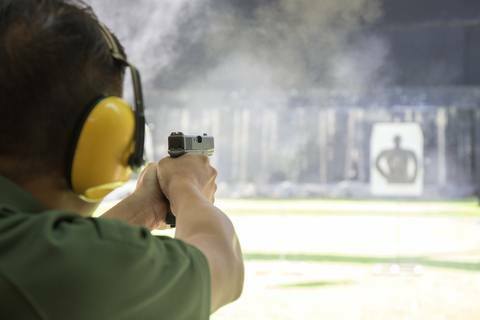 When you head to the range for the first time, we recommend either bringing a friend who's comfortable with firearms or asking for instructor assistance. It's just like learning anything else: even when you've studied the fundamentals, you'll end up ignoring some of them without even realizing it. Having someone who can watch your stance and keep an eye out for flinches and the dreaded lean-back makes it a lot easier to avoid forming bad habits. Most ranges offer some form of coaching or basic instruction - don't be afraid to ask! Practice makes perfect, in shooting as in everything else. To get the most out of your training, think about why you're learning how to shoot a pistol. You're probably not going hunting with it or entering the Olympics, or finally getting rid of that wasp nest your wife's been on you about. It's for self-defense, protection against an aggressor. That said, we need to bear in mind the principle of "train like you fight." 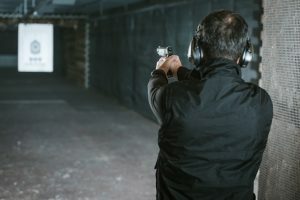 Taking slow, measured, individual shots at the range is excellent for learning the basics, but if (God forbid) you end up in a situation where you need to use your gun defensively, you will probably not be carefully assuming your stance, double-checking your grip, finding the sights, slowing your breathing, and then carefully squeezing the trigger. 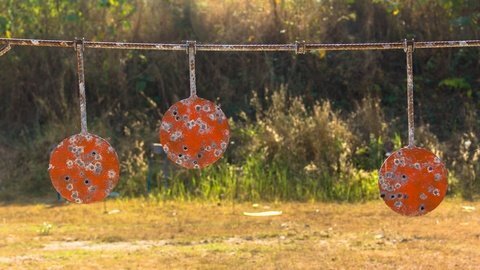 After your initial skills feel solid, begin to practice rapid-fire exercises like the Mozambique Drill. 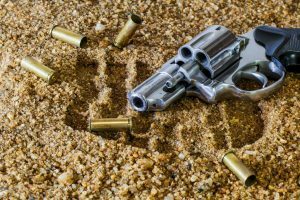 Self-defense pistol shooting happens under enormous pressure and often requires rapid follow-up shots. Train like you fight - practice for realistic encounters, rather than the range. 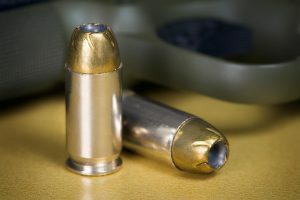 It's worthwhile in many cases to incorporate Snap Caps, dummy cartridges, meant to protect the firing pin from excessive wear, into your training as well. Have a friend load them into your magazines at random or intersperse them in your revolver's chambers and give them a spin before locking the cylinder. 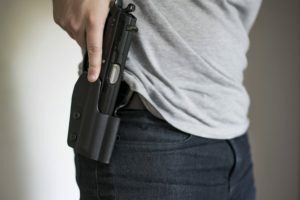 If you're flinching or jerking in anticipation, it will quickly become apparent when you yank the gun in the absence of recoil. Just keep practicing, and you'll be surprised and pleased with how fast your accuracy improves! 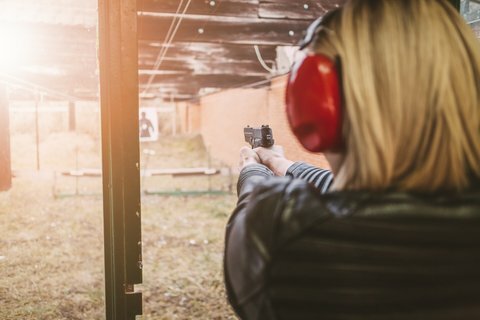 You should have a good idea of some of these by now, so let's review a few key things not to do when learning how to shoot a pistol. First of all, don't lean back! Overcome that part of your lizard brain that's yelling at you to get your face away from the noises and fire. Remember to center that trigger finger. Don't push the gun to the side with the tip of your finger, or pull it to the other side by using the crook of your knuckle. Try hard not to flinch - this takes practice, but you'll get there with familiarity. Make sure you're standing in a comfortable and balanced stance while shooting. For best results bring the pistol up until the sights align with your eye, then aim. 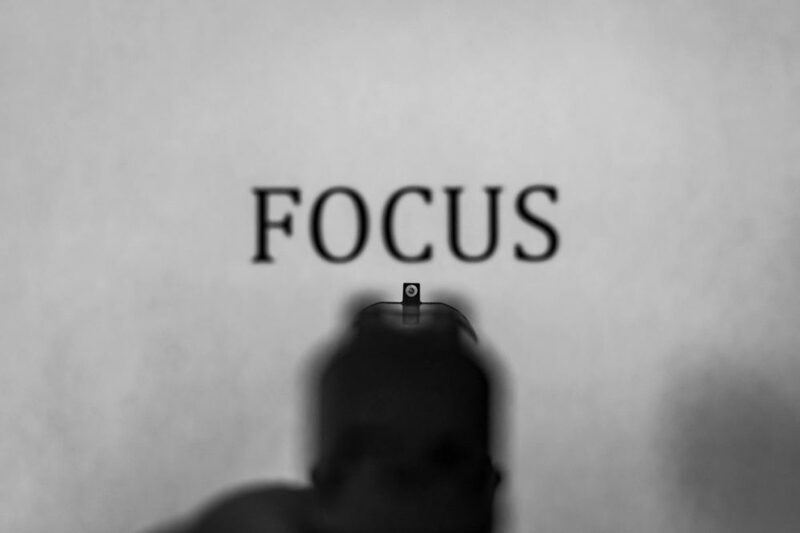 Last, don't focus on the target, focus on the all-important front sight. For ear protection with sound amplification that will allow you to hear between shots we recommend the Howard Leight by Honeywell . If you like just the good ole fashion none high tech earmuffs then go with th Pro For Sho 34dB Shooting Ear Protection . They give great protection and are very reasonable priced. For earplugs, you can use plugs that are attached by a cord that makes them easy to take in and out of your ear and prevents you from losing them like thes Soft Silicone Corded Ear Plugs . However, we believe you cannot beat the basic earplugs like the Mpow Soft Foam Ear Plugs . In our opinion, they are cheap easy to use and protect your hearing just as good as the more expensive options. Last but not least are the targets. We recommend a pistol correction chart target pack and have had good results with Birchwood Casey Shoot-N-C Handgun Trainer. For those who have been shooting for a while, the Birchwood Casey Shoot-N-C 6-Inch Round Target is a great option. Both targets highlight hits with a spray of color. Your local range can likely supply you with the basics as well. Trust us, the biggest hit your wallet stands to take is all the guns you'll want to buy once you've gotten the hang of shooting. We hope you've enjoyed our guide!